Feel dizzy at times? It may be a sign of balance problems in your vestibular system. Vestibular issues can have a profound impact on your life. Often, you don’t know when or where the dizziness will strike. It can limit your activities, create a feeling of unsteadiness while doing tasks, or even affect something as simple as walking. The Centers for Diseases Control and Prevention cited that those who have balancing issues are at high risk of falling and incidence rate to this problem is almost epidemic specifically to the elderly. Vestibular issues are a serious matter. Body Restoration physiotherapists understand the risks and symptoms of vestibular dysfunction. We focus in on the root cause of the problem, and help you address the issue head-on and as quickly as possible. Body Restoration’s highly trained and qualified clinicians use vestibular rehabilitation techniques known to effectively improve balance for individuals who have vestibular dysfunction. 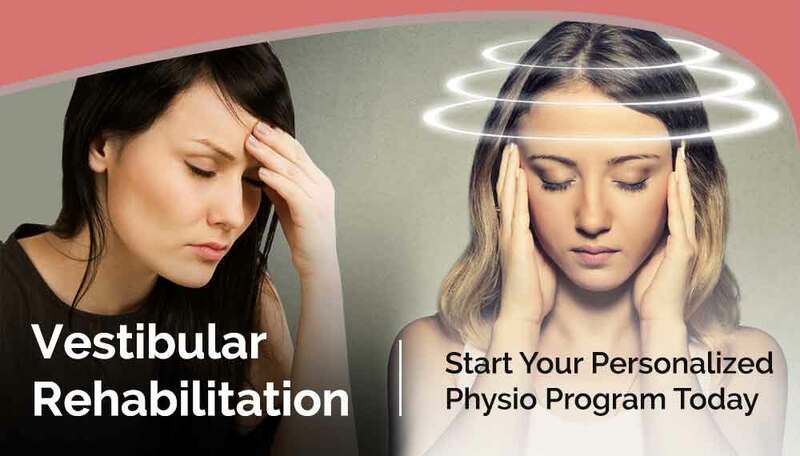 Our program focuses on re-improving the balance for individuals who have dizziness-related problems, vertigo, Meniere’s syndrome, benign paroxysmal positional vertigo (BPPV) or migraines. If you have had a stroke or previous brain injury, you may also benefit from vestibular rehabilitation we offer. We’re dedicated to providing comprehensive assessment and effective treatment strategies. Since 1992, we’ve helped thousands of patients across St Albert and Edmonton, including those who have vestibular disorders and have helped restore their active and healthy life. Our therapists continue to developed guidelines and advanced methodologies to effectively identify and treat vestibular disorder. Medical conditions such as Benign Paroxysmal Positional Vertigo, Unilateral Vestibular Hypofunction, Bilateral Vestibular Hypofunction and post head trauma or concussion can also benefit from vestibular therapy. Get a no obligation appointment from licensed and qualified physiotherapists. Vestibular rehabilitation is an on-going process that must be monitored by a qualified clinician. From assessment to finding the right vestibular therapy program, Body Restoration has experienced professionals who can help you all along the way. Your vestibular system is a sensory system that provides input in our sense of spatial orientation and balance. The same as any part of our body’s system, the vestibular system can also become prone to injury or impairment. Each year, more than a million patients visit their doctors due to dizziness. Most commonly, complains are from ages 65 although vestibular disorders can happen at any age. Often, dizziness is generally not serious but it could be a sign of mechanical imbalance. It can be because of medication side effects, inner ear disorder, neck dysfunction or symptoms of a more serious condition like brain or heart problem. Dizziness, nausea and double vision are signs that there’s an ongoing negative feedback mechanism and it has to be corrected. While pharmaceutical options and surgery are known to improve dizziness, the evidence of vestibular rehabilitation’s improvement for patients continues to grow. Vestibular therapy is also a safer alternative approach towards complete balance rehabilitation because prolonged use of medications or surgeries are not needed. Vestibular rehabilitation is specifically built from an individual’s overall symptoms and through biomechanics analysis. The therapy must only be administered by qualified clinicians. A qualified physiotherapist will perform thorough evaluation starting with your medical history, then to understanding the severity of your symptoms and finding the right therapy option that will match with your needs and lifestyle. The assessment will focus on motion sensitivity, balance and gait performance, neck joint stability as well as eye and head coordination. Your personalized vestibular therapy program is likely to involve balancing exercises, manual therapy to mobilize stiffed joints and supervised, monitored therapy sessions. With the right vestibular rehabilitation program, you are expected to have improved vision stability, better balance, increase body strength, decrease dizziness symptoms, improved ability and can return to prior level of function. Start your way to regaining a life without worry. Contact us for a no obligation appointment.